Before it was called the "cloud," Giva was at the forefront of providing software-as-a-service (SaaS) applications for help desks, call/contact centers, and customer service support groups. As web technology has improved, Giva has made it a priority to provide elegant and easy-to-use systems for today's user. With the growth of mobile use, Giva has continued to provide our customers with an elegant and easy-to-use system for technicians and customer support personnel to provide superb customer service to their users. Giva's recently launched next generation mobile application is called eMobile and is a HIPAA-compliant, HTML 5 version of our help desk and customer service software. It is unique from all other mobile applications since it is completely browser-based, not requiring any application to download or install, and works with the most commonly-used mobile operating systems and devices, such as iOS and Android. Color-coded event notifications, such as major outage, on hold, etc. Ticket workflow editable fields, such as Subject, Status, Assignee, etc. Supervisors, managers and executives can benefit from Giva eMobile by being able to view tickets from any one of several different ticket views allowing them to quickly monitor issues of concern or high importance. 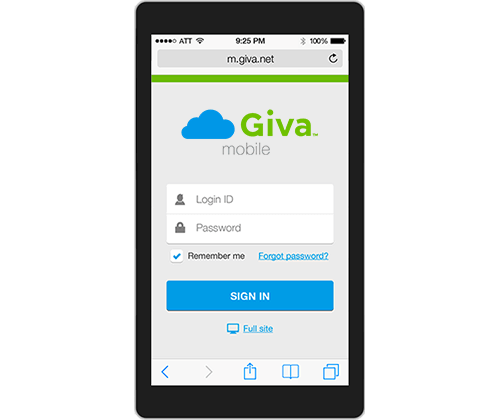 For more information, see Giva's eMobile page and request a free trial today!